French historical painter; born at Blotzheim, Alsace, May 24, 1829; died at Paris Feb. 24, 1884. He studied at the Ecole des Beaux-Arts under Drölling and Picot, and in 1859 won the Prix de Rome. Of his paintings may be mentioned: "Sylla at the House of Marius" (1866; now in the Luxembourg Museum); "Patroclus and Amphidamas" (in the art gallery at Mans); "Junius Brutus" (in the museum at Melun); "Remorse"; "The Gitanos of Granada"; "The Bell-Ringers of Nuremberg" and "The Lorelei" (exhibited at the Paris Salon, 1872); "A Defeat"; "The Hour of Wailing"; and "The Deliverer of the Fatherland." 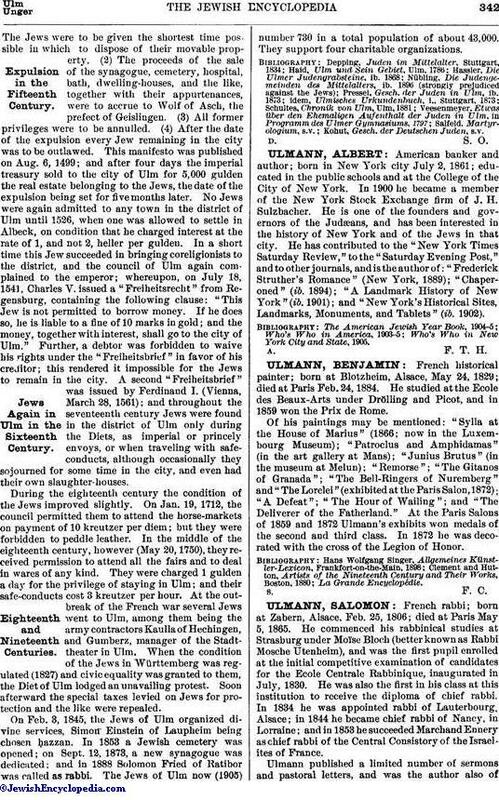 At the Paris Salons of 1859 and 1872 Ulmann's exhibits won medals of the second and third class. In 1872 he was decorated with the cross of the Legion of Honor.